A Northwestern wrestler takes down an opponent. The Wildcats have struggled this season, losing their last four competitions. Spotting No. 24 Rutgers 12 points, No. 23 Northwestern put up a robust home charge, but the opening advantage was just too much. The Scarlet Knights (12-7, 2-7 Big Ten) defeated the Wildcats 22-19 on Sunday night, increasing NU’s (9-8, 1-7) losing streak to four. It was the latest in a line of demoralizing defeats and third consecutive losing effort at home for the Cats, but this one had a different character from the previous iterations. After voicing his displeasure at his team’s fight last week at a 25-11 loss to Nebraska, coach Drew Pariano was far more upbeat about Sunday’s contest. Of course, outcomes don’t always take care of themselves when a team is subjected to a 12-point hole. 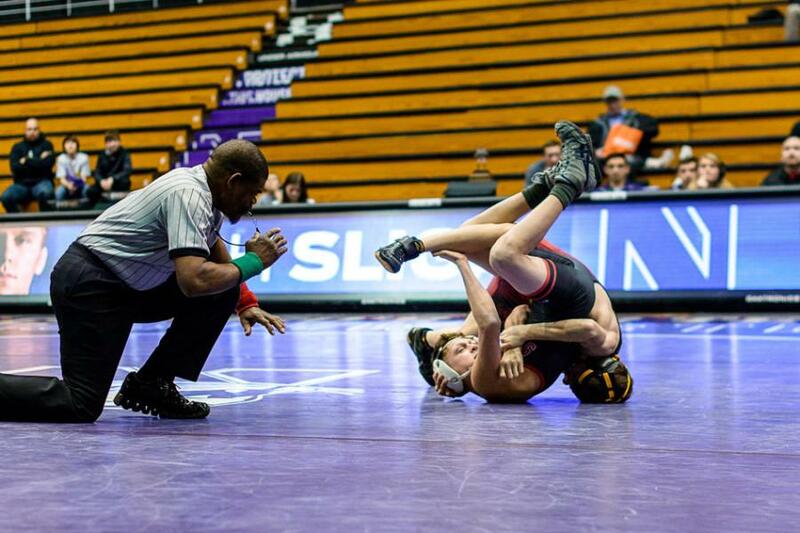 NU was stuck in that position due to a pair of forfeits. The Cats have been forfeiting all year at 174 pounds, costing the team 6 points, but NU added a second at 157 against Rutgers because a lingering illness had sapped Ben Sullivan’s strength. From there, it seemed the Cats were doomed. The match turned at the 197-pound weight class battle. Down 15-3 following the two forfeits, the Cats likely needed at least one fall to harbor hopes of victory. And Alex Polizzi stepped up. Ranked No. 16 at 197 pounds, the senior pounced on unranked Scarlet Knight Hayden Hrymack, jumping out to a 2-0 lead after the first period and opening up a 7-0 cushion when he saw his moment of glory. The resulting fall netted the Cats 6 points, and suddenly the team was back in the match down just 15-9. Back-to-back victories ensued, and the match was tied. Then NU came to its worst match-ups, Dominick Malone vs. No. 18 Scott DelVecchio at 133 pounds and Jameson Oster vs. No. 9 Anthony Ashnault at 141 pounds. In the 133 match, the Scarlet Knights scooped up a major decision to move ahead 19-15. Oster completed what Pariano deemed “a phenomenal match,” battling from a 3-0 deficit in the final minute and nearly tying his match in the closing seconds, but when his last-ditch effort failed, the Scarlet Knights were up 22-15 and had secured the victory. The growing pains continue for a short-handed Cats squad, but progress was at hand. NU had relied too heavily on No. 3 Tsirtsis, No. 8 Pierce Harger, No. 4 McMullan and No. 16 Polizzi in recent times. No Cats wrestler outside that quartet had captured a single match in the previous three contests. Against Rutgers, though, White came through with a victory, and Oster nearly put a second on the board. Pariano pointed to confidence as a necessary tool to get this group back on track. The junior Malone, who suffered his fourth straight defeat in a 10-1 major decision loss Sunday, concurred. This is the closest NU has looked to on track in recent weeks, and it comes at a time when an upcoming nonconference slate could mean a late run. The scoreboard read against the Cats, but Pariano saw plenty of positives.